Come visit us at the AAM annual meeting and museum expo in Minneapolis Saint Paul! We’ll be in booth #1200. 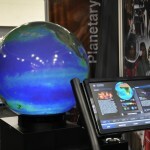 Stop by to get an in-person demo of the Magic Planet and to see what’s new from Global Imagination. The expo will take place at the Minnesota History Center. Check out the latest newsletter from Global Imagination, including stories about the exciting ways customers are using the Magic Planet to communicate with, and educate the public. Read it now by clicking here. The Magic Planet was prominently featured in The New York Times’ Science section this morning with a feature article by Mark Vanhoenacker. Check it out for yourself at NYTimes.com by clicking here! You can now view a full image of the article on our site here.